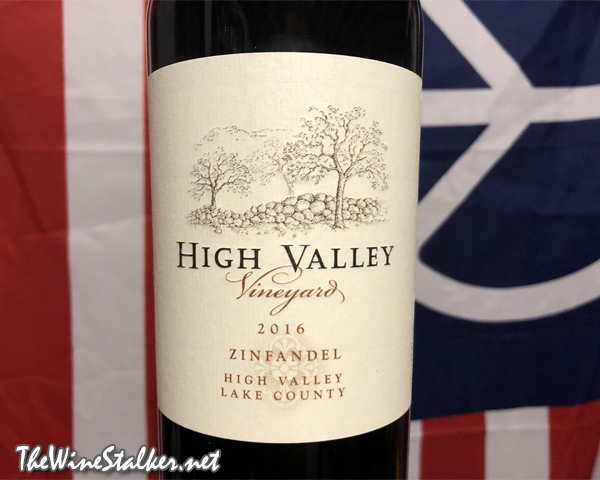 High Valley Vineyards is Shannon Ridge's label from the High Valley AVA in Lake County, which is between 1,600 and 3,000 feet in elevation. The 2016 Zinfandel is from the north facing Round Mountain and Terre Vermielle Vineyards. It saw aging in 80% French oak and 20% American oak, but I do not have the information for how long, nor if this is 100% Zinfandel or if it has other varieties blended in (although, I will take a wild guess and say there is some Cabernet in there). The ABV is 15.1%. The color of the wine is crimson. On the nose the aromas of baking spices like vanilla and cinnamon come first and foremost, followed by sweet tobacco, blackberries, prunes, and a nice ethanol burn at the end of your sniff. On the palate it's medium bodied with heat from the alcohol, a perky acidity, a touch of sweetness, and (like I've found with all of Shannon Ridge's reds) smooth and lush in mouthfeel with soft tannin. There's flavors of blackberries, plums, dark chocolate, vanilla, and caramel. Then the vanilla and caramel kick it into high gear on the long, lip-smacking finish. As you know, I have a bit of a problem with 98% of the Zinfandel that I taste. But this doesn't present any of the problems that I have with the varietal. It's not over-saturated candied fruit and plum skins. It's not a terrible attempt at making unfortified Port. I'm not sitting here wondering why anybody would want another glass of this. In fact, I'm looking forward to that next glass. This is a Zinfandel that I can absolutely get behind, but it will cost you $30 and I have to reflect that in the score. The quality for the price is there. You're not wasting your money at all. But I think $30 wine consumers might be looking for a bit more complexity. The day will come when they're ready for a wine that will go great with loud friends and barbecue, and this wine will be waiting for them. And everybody will love it.